Today is the day before April, the day for me to reprint my now-traditional day-before-April post, It's also Easter Sunday, a day of joy for me and for Christians all around the world. Shortly I'm off to the sunrise service that Christopher helped to organize with the St. Paul's UMC youth group, followed by an Easter church breakfast, and then the glorious processional at the 10:15 worship service: "Christ the Lord Is Risen Today!" But first I need to celebrate the day before April. My mother, my sister, and I have long celebrated "the day before April" as a holiday, a Mills family holiday. A few years ago I hosted a "day before April" party, with my mother and my boys (who did think it was a somewhat strange party) as the only guests. I usually gave my mother flowers on that day. In honor the day, I'm going to go buy some flowers - daffodils, probably. Three years ago, when I first wrote this post, I took daffodils to my mother, who was in a rehabilitation center after a fall that broke her hip and arm; she died two months later. My daffodils today are in memory of her. Happy Easter, to those of you who celebrate Easter. And happy day before April, everybody. I use envy as radar. When I feel a twinge of envy toward someone, I try to locate the source of the envy, and then I say to myself, "Hmm. This points me toward something I want to have in my own life." Over the years I've kept track of the people I envy and why. I don't think I've ever envied people for having money or any of the things that money can buy. I don't need to envy people for good health, because I have enviable health myself. I admit I'd like to have more recognition from the universe for my work as a writer, but I can't say that I envy fellow authors who win the Newbery or the National Book Award. Maybe that's because I don't think of those things as genuine possibilities for me. And maybe I already know that those things don't bring lasting happiness. Instead, the people I envy are those who fill their lives with a certain kind of creative joy. They don't wait until they win a major award to give themselves permission to pursue lives that radiate creative energy. They prioritize creativity in their lives every single day. Case in point: my friend Cat. She is a writer married to a writer; together they are parents of a three-and-half year old little boy, Max. Their house is suffused with creativity, as well as with love and laughter. When I had dinner with them the other night, they took me right away to admire the display of peep-o-rama dioramas that they had made with the Easter candy Peeps. The one they made for me is pictured below. Titled "Just me and my peeps," it represents the fun of my subdivision pool in summertime. 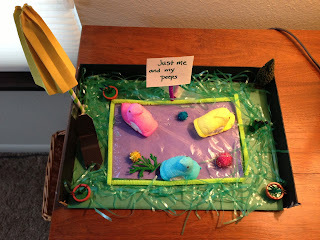 Another of the dioramas was captioned "The artist formerly known as Peep." The Peeps in that one were staged as a rock band, complete with vests and electric guitars. "Power to the Peeple" staged a Peep protest with the small marshmallow chicks waving appropriately indignant signs. Max had made his own peep-o-rama, theme uncertain, but creative joy in fashioning it unmistakable. Now, I don't particularly want to make my own Peep dioramas. But I want to throw myself into my writing, as Cat and Doug do, and offer creative opportunities to the larger community, as they also do, in Cat's case by teaching writing classes on topics such as journaling during pregnancy and crafting creative monologues for performance. And I want more creative play - more "just-because" projects that have no point other than the fun of savoring that creative moment, bringing something new and strange and wonderful into being. So maybe I DO want to make my own Peep dioramas. Until this week, that never existed for me as a creative option. Now, thanks to Cat and Doug and Max, it does. So these activities would have amply filled my days back home. But then I decided to tackle the project of cleaning out my attic. I bought my house five and a half years ago, and somehow in those years my good-sized attic moved from empty to stuffed: things I couldn't part with from cleaning out my mother's apartment, things left over from cleaning out two houses the summer before last, the extra-long twin bed sheets from Gregory's freshman-year dorm room, dozens of gift bags in perfectly good shape to re-use, cartons filled with author's copies of my books, huge quantities of green plastic grass for the boys' Easter baskets (yes, at 21 and 24 they still get an annual visit from the Easter bunny), boxes from Xbox game systems in case they break and need to be returned, and much much more. I had planned to clean the attic this summer, as part of my launching my new back-in-Colorado life, but when I went in there this past weekend to retrieve something, I saw that the considerable amounts of roofing residue had fallen all over everything when the roofers installed new attic vents while putting on my new HOA-ordered roof while I was away in Indiana. And it also occurred to me that cleaning an attic is much more pleasant during cool spring days (very cool! we've had ten-and-half inches of snow since I've been home!) than in the scorching days of summer. And so I began. Cleaning an attic is not an hour-a-day task. It is an obsessive, all-consuming, completely absorbing task. I worked yesterday like a woman possessed, dragging out everything so that my bedroom and office are almost impassable now. I tossed, recycled, sorted, consolidated. Today is the un-fun part of vacuuming up the roofing mess. And then comes the bliss of putting everything back in apple pie order. Then I can walk into the attic and hug myself with happiness. Next up: the garage! I am a woman with a mission! I am a woman who cannot be stopped! I write this from Warrensburg, Missouri, where I am attending the 45th annual Children's Literature Festival sponsored by the University of Central Missouri. I don't remember the year I first started attending, but I know I've come for at least fifteen years now. The three-day festival brings a few dozen authors to campus each March (during the university's spring break) and buses in a few thousand schoolchildren from all over the state of Missouri. Then the authors spend all day talking to groups of kids, and the kids spend all day hearing talks from lots of authors, and for the rest of the time the authors hug each other, talk, talk, eat, walk, laugh, cry, talk, walk, talk, go shoe shopping, eat, and talk some more. The festival has a remarkable family feel to it. The organizers enlist their husbands, grown children, and former students (including one who even flies in every year from Arizona to help with the event) to do everything from chauffeuring authors from the Kansas City airport to selling books, checking in school groups, and filling every minute of the festival with happiness for all. I love how much the festival is the same every year. A few new authors show up, but mainly the authors flocking to Warrensburg this weekend are those who have supported the festival for decades. We always eat our first meal together at Heroes, in downtown Warrensburg (where their signature drink is the delectably potent Unknown Hero). We always take a walk on Sunday morning to see some cows. We always have a fancy luncheon with teachers and librarians on Sunday in the student union building, always with the same pasta buffet. We always sit in the same order at the same tables to sign books at a reception following. The same ladies who organize another children's literature festival in Nebraska always stop by offering the same bags of the same melt-in-your-mouth chocolates to authors here who ever attended their festival there (I haven't, but there are a LOT of these bags of chocolates handed out, so I always get my share). And so the festival continues. The authors who attend, like all human beings, have lives that are filled with change, sometimes beautiful change (welcoming new children and grandchildren), sometimes heartbreaking change (burying parents and spouses); many of us are struggling to keep our careers afloat on an ever more turbulent sea and doing all that we can to reinvent ourselves as writers to remain competitive in the bunny-eat-bunny world of children's book publishing today. But for a few days each year, we come together to eat sacks of wrapped chocolates, buy shoes at Brown's old-time shoe store, and visit some cows who seem much less interested in us than we are in them. For a few days each year we come home to Warrensburg. This is the kind of thing that I think might happen only here in Greencastle. The other day I was in line at the post office (in the very short line at our little friendly post office) when a pleasant woman came up to me. Although we had never met, she recognized me as the visiting professor who is also a children's book author and asked if I would be willing to come as a speaker to the after-school tutoring program she's involved in at Gobin Church. Of course, I would! I like to show the children some of my translated books, especially the copy of I have of You're a Brave Man, Julius Zimmerman in Japanese, which opens from (what we would call) back to front, with the type arrayed vertically rather than horizontally on the page. Well, in yesterday's session, one girl in the group was Japanese, here in the U.S. only recently, attending the tutoring center to work on her English-language skills. She was too shy to want to read aloud from the book to her fellow students, but her mother was in the room, and she accepted an invitation to let us hear what the book would sound like in Japanese. It was a thrill for me to hear, for the first time ever, my story read aloud in this very different-sounding language. I could detect Julius's name from time to time. Oddest of all to my ears, I could hear little bits of French interspersed among the Japanese, as the opening scene of the book takes place in Julius's summer French class. As the mother reading pronounced all the French perfectly, I realized (and confirmed afterward) that she speaks French as well as English and Japanese. So I had the joy of hearing my own book read aloud to me in a language spoken half the world away by the mother of a child in a group I was speaking to because in this tiny friendly town on the edge of western Indiana someone had recognized and greeted a stranger in their midst. Pretty sweet, wouldn't you say? Springing forward into Daylight Savings Time is always painful. Springing forward in early March (rather than in late April, as we did in days of yore) is agonizing. Springing forward in early March in western Indiana is torture. When I moved to Indiana a year and a half ago, I was stunned to discover that the part of Indiana where I live is on Eastern time, even though we are two and a half hours south of Chicago, which is on Central time, and positioned west of Nashville, which is on Central time. We are on the farthest west fringe of Eastern time, which means that it is DARK here in the mornings. VERY VERY DARK here in the mornings. But as the days crept along, moving us from the winter solstice toward the vernal equinox, it was finally getting so that the mornings were a teensy-weensy bit light, a few pale rays of hope peeking over the horizon. Progress was being made. And now, with that hour cruelly lost last weekend, all progress was undone, and the sun rose in Greencastle this morning at 8:03. 8:03!!! I want to answer Emily, "Not in Indiana, no way!" Okay. No more wallowing in despair. I need to get a grip on these dark mornings. So here are the bracing thoughts I'm trying to tell myself. 1) For a person who gets up early, as I am supposed to be, it shouldn't matter whether the sun rises at 7 or 8. A soi-disant morning person should be up at 6, or 5, or 4, long before the dawn. 2) The days WILL get longer, much as it seems now that they won't. Brighter mornings are guaranteed by the laws of science themselves. 3) So this is just a temporary setback. And I've had so many temporary setbacks in my life. I've had rejections, bad reviews, heartbreaks, various devastating losses. I'm good at bouncing back. I'm good at starting over. I just checked the Old Farmer's Almanac online, and tomorrow the sun will rise in Greencastle at 8:01, and by the Ides of March it will rise at 7:58. We're making progress to the tune of a minute a day. And that's the way that spring comes, a minute at a time. The Lois Lenski children's literature lecture that I presented at Illinois State University on Monday night was entitled "The Dilemma of Didacticism." It was my attempt to wrestle with arguments for and against trying to use children's literature to teach moral values to children. Most children's writers I have ever heard speak on the subject adamantly repudiate any attempt to craft a story that has a message or a moral. Arguments against didacticism include: children will refuse to read preachy tomes; the moral mission of the book may actually backfire (my beloved Jean-Jacques Rousseau says in Emile that attempts to warn children away from bad behavior may serve to introduce the idea of that bad behavior to children in the first place); most of all, moral earnestness simply leads to the making of bad books. But in favor of didacticism (at least of a certain kind of didacticism), I argued that I do think a book - whether for children or for adults - should say something. As I reader I care less what happens in a story than what it all means, why this particular stretch of human experience was worth writing about. It's always the epiphany moment that makes me cry, the moment when the character finally "gets it," realizes some small crucial truth about the world and about herself. So the crucial issue is not whether to try to share moral values with children, but how. In the second half of my talk, I reviewed a number of pieces of standard advice (and in some cases, quite excellent pieces of advice) about the do's and don'ts of didacticism: Pose a question but don't answer it, let the moral emerge from the story rather than structuring the story deliberately and consciously to reveal it, present a moral or message that is rich and interesting enough to resonate with adults as well as with children, let the main character discover it herself, and don't herald the presentation of the "moral" with a fanfare of "telling" language. Oh, and make sure the moral is actually true, and don't deliver it in atrocious rhyme! But then to problematize everything I said, in closing I talked about one of the greatest children's books of all that that violates just about all of these requirements, except that the moral is true, there is no bad rhyme, and the main character discovers it for herself. But the book presents a ringing answer to the moral question posed, the story is clearly structured to focus on its central issue and wring one definitive lesson from it, the lesson is extremely simple and familiar to almost any adult reader, and it is labeled with as clear a moment of narrative fanfare as I have ever seen. The book is The Hundred Dresses by Eleanor Estes. So my conclusions were that it's awfully hard to distill any hard-and-fast guidelines for how to moralize to children. Nonetheless, we shouldn't refrain from trying to share our values with children through stories as insightfully, passionately, and beautifully as we can. I love when my writing life comes full circle in beautiful ways. I especially love it when as a grownup writer I have the opportunity to pay homage in some way to the books I loved as a child. 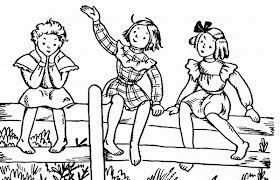 And most of all I love it when this opportunity has anything to do with my most beloved books of all: the Betsy-Tacy books of Maud Hart Lovelace,illustrated by Lois Lenski and Vera Neville. Based on the author's own childhood at the turn of the last century in Mankato, Minnesota (Deep Valley, in the books), the series (published during the 1940s and 1950s) chronicles the small adventures of a trio of friends, Betsy, Tacy, and Tib, from Betsy's fifth birthday party through to Tib's wedding. Betsy loves to write, and in her I found the inspiration for my own career as a writer. One high point of my life as a writer, which came a few years ago, was the chance to do a book signing at Tacy's House in Mankato, now maintained as a museum by the Betsy-Tacy Society, of which I am an ardent member. Another highlight was presenting some of my scholarly work on the presentation of the Syrian characters in the books at a Betsy-Tacy fandom conference. And tonight I have the honor of delivering the 20th annual Lois Lenski Children's Literature Lecture at Illinois State University in Normal, IL. You can well imagine how ecstatic I was when I received that invitation! I'm not going to be lecturing about Betsy-Tacy tonight. Instead my talk title is "The Dilemma of Didacticism," interrogating the long-standing alleged taboo against writing children's books that try to teach a moral lesson. I'm going to give a qualified defense of didacticism, using as an example not Betsy-Tacy but another book I love almost as much: The Hundred Dresses by Eleanor Estes. But I know that somewhere in the heaven where fictional characters live on, Betsy, Tacy, and Tib will be smiling down on me, the girl who grew up to be a writer from loving them so deeply and so well. Our DePauw women's basketball team, with an undefeated 25-0 record during the regular season, advanced last night to the "sweet sixteen" in the NCAA women's division III playoffs. The game was held right here on campus, in our Lilly Center, and I was there to see them play. Previously a complete sports ignoramus, I've now learned a few things from watching several DePauw women's basketball games this year. My favorite thing that I've learned concerns the "thirty-second clock." When each team get the ball, a visible clock above the backboard begins counting down thirty seconds; each team gets thirty seconds in which they have to attempt to shoot, and if they don't shoot in that time, the ball is given to the other team. For the first twenty of those seconds, nothing much happens. They pass the ball back and forth around the perimeter of the court area, casting glances at the choice inner region where they'd prefer to be, but the other team's guards keep them from getting to that sweet spot. As the clock reaches 11 seconds, their teammates seated on the bench start chanting the countdown aloud, to give them notice that time is running out: "Ten! Nine! Eight! Seven!" Things still aren't looking good. Then, as the player with the ball hears "Five! Four! Three!" she has no choice but to do something. So either she shoots from farther away than she likes, or she somehow miraculously muscles her way to a closer shooting spot. And guess what? In the games I've seen, as often as not she scores - and even scores a three-point outside basket. And if she misses, as often as not a teammate grabs the rebound, shoots, and "Two points for DePauw!" So of course I can't resist applying this rule of basketball to writing and to life. Alas, in writing and in life, there is no actual thirty-second clock. Instead we can spend YEARS bouncing ideas idly around the perimeter of the court, hoping that somehow a promising avenue of approach will open up, and then one does open up that seems sort of good, but hey, if we wait a little bit longer, another one may open up that is even better. So we dribble our lives away, and nothing ever happens. But whenever I've been under a real time crunch, with a real deadline (even if self-imposed), and I force myself to shoot, force myself actually to put some words on the page, guess what? As often as not those words are pretty good. And if the words fall short of the goal, as often as not I now have the writing momentum to seize my pen again and rewrite them. Then: "New book, or paper, or poem for Mills!" Yay for the thirty second clock! March arrived today, like neither lamb nor lion. Maybe like a damp, shivering lamb, poking its little head in under gray skies spitting a few raindrops alternating with snowflakes. So today is the day I begin my new life for March. 1. Lunch several days at the Blue Door Cafe, which has finally reopened after being closed for almost two months, a victim of competition from the newly opened Starbucks on the Courthouse Square and the general lull in activity over the holidays and Winter Term when so many students are off campus. I was so heartbroken to have its doors locked against me that I couldn't even bear to write about it, but now it's back, and I am trying to go there every single day to show my support. 2. Breakfast almost every day at the Hub in the student center on campus: EXTREMELY delicious oatmeal with brown sugar and canned peaches. I assemble my bowl in layers: a layer of oatmeal, a layer of brown sugar, a layer of peaches, repeat. 3. A mid-day talk by Chicago playwright/director Sean Graney, who is adapting all 32 surviving Greek tragedies into one huge twelve-hour mega-tragedy, or rather, mini-tragedy - well, mini in that it's so much reduced from the original, but mega in that twelve hours is a long play by any standard! I love being in the company of people who dream up offbeat creative projects. 4. A performance of 21st century music by composer-in-residence Libby Larsen, which included her moving oratorio drawn from the words of Eleanor Roosevelt. 5. A wine-and-cheese faculty gathering to talk about what gives us joy in our work, and why - just my kind of thing! 6. One-on-one appointments with delightfully motivated students to talk about their soon-to-be-due papers for my course on the philosopher John Rawls. 7. Tea in my office at the Prindle, looking out at the winter-bare courtyard on a gray afternoon. So my goal in March: more Blue Door, more oatmeal, more offbeat creative projects, more conversations with students, more tea, and more joy.